A great article from Business Insider highlights a challenge we are all too familiar with at Furia Rubel. All of our employees engage in social media and have for a few years now. However, occasionally through speaking engagements or meetings with perspective business we come across the social media skeptic. They're easy to recognize. They may scoff, hem and haw or scarier still- don a blank expression when the topic of social media comes up. 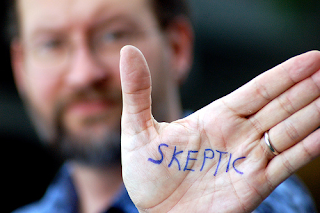 If you should come across a skeptic, here are some excellent ways to ease them into social media engagement. 1. Remove Barriers. Lisa Barrone of Outspoken Media encourages employers to alleviate employees' social media anxiety by taking barriers out of their way. Barriers could be anything from having to learn to use new tools to manage social media like Hootsuite or Tweetdeck, or adding yet another task to their all ready busy day. It's important to first identify these potential barriers then determine how to remove them. For example, if time is an issue, Barrone suggests allowing employees to blog, tweet or connect from home instead. 2. One at a time. Personally, when I joined Twitter I found it very overwhelming. I considered myself fairly tech savvy and having used Facebook since its infancy, I assumed I could get the hang of Twitter quickly. I immediately started following lots of people and trying to engage. Over time though, I realized that I needed to sit back and observe the kinds of conversations taking place and the way people were interacting. Each social media network is like a neighborhood in a city or region of the country. It takes time to get used to how each looks, feels, and how people act, talk and perhaps most importantly, get annoyed by. So have your employees take one at a time. I would encourage employers to identify which social media network is most useful to employees. Law firms or financial service providers may opt for the conservative, business-friendly LinkedIn first, whereas a consumer services company may choose Twitter because they want to improve their customer service and start interacting directly with customers. 3. Provide Guidelines. I could not agree more with Barrone's suggestion to provide employees with guidelines for social media engagement. If members of your staff are hesitant to say or do the wrong thing when social networking, that may prevent them from engaging. If there is a social media policy in place, they'll have a better idea of what they can and can't say. No one wants to put their job in jeopardy by saying something in a public forum that could get them or the company in trouble. 4. Provide Resources. A social media policy is a great example of a resource that employees need to have in order to use social media. Other resources could be an online forum where employees can ask questions, share strategies or read about new tools or emerging social media platforms. Barrone suggests setting up a Wiki. I would also add a weekly email, call or meeting could be beneficial. 5. Success stories. The best way to stop a skeptic dead in their tracks is to provide them with a social media success story. There are plenty out there, like the Old Spice Man, Zappos, or Delta's new ticket purchasing campaign on Facebook. All you have to do is pick up the newspaper and find a recent example of a company or brand using social media to boost their bottom line to see that it works. With proper training, support and guidelines, even the most skeptical employee can and will engage in social media. Listen to their concerns and questions, encourage them to share their good ideas and let their personalities come through in their social media profiles, tweets and blog posts. Ultimately, the success of a company's social media engagement hinges on their employees' comfort, knowledge of and ingenuity with this valuable tool.